I’m a numbers kinda gal. I find safety and security in them. I’m that girl that actually studies her spending and her budgeting. I maximize the rewards I can get on each credit card (6% back on groceries?? Hell, yes!) and I always pay off the balance in full. You’re rolling your eyes, but this stuff legit excites me. And before you go, “That must be nice for you lady. But over here I’m running a business and it is ALLLLL about the money,” allow me to explain. It’s about what the money CREATES for you in your life and business. → It creates comfort and stability just KNOWING that number in your bank account. → It creates more time and more success by outsourcing tasks outside your zone of genius. → It creates convenience by having your groceries delivered. → It creates experiences and memories through epic vacations. → It creates health and wellness through that yoga membership. The list goes on. Because money isn’t THE THING. It’s what you can create with money that matters. 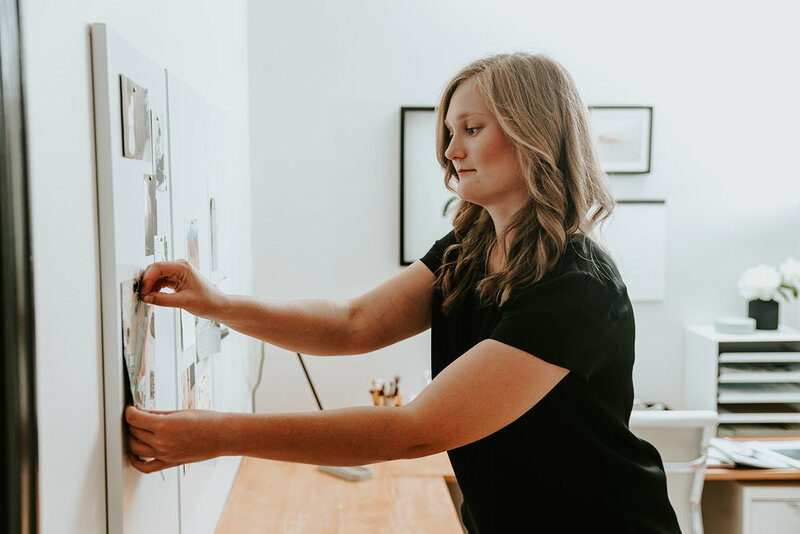 This is exactly why vision boards are so important—because they help you to boost your sales, make more money, and create more of what you actually WANT in your life and business. And I don’t know about you, but I LOVE seeing a beautiful reminder of what I’m working toward each day. But you don’t have to take my word for it. Here’s a study that shows how having a vision board is ESSENTIAL to your success as an entrepreneur. I’m dedicating this post to all my skeptics out there! Like I mentioned earlier, success isn’t only about money. It’s about what you can CREATE with money. Having that visual reminder can be really powerful because it will shift your mindset from simply thinking about the numbers to what those dollar signs would actually do for you in both life and business. And remember more life goals on your vision board doesn’t mean that your business will suffer as a result. I’ve actually found the opposite to be true. My last vision board focused on more time outdoors—hiking, backpacking, and huddling around a campfire. And you know what? My business actually did BETTER during this time because I was in alignment with what I actually wanted and that was showing up in every aspect of my life—even the client calls and weekly newsletters. You know when you have a million things swimming around in your head and you finally take the time to write them down on your to-do list? You feel so much lighter and it all feels so much more doable. That I-can-conquer-the-world feeling happens when you create a vision board too. Why? Because you take those vague ideas and you pull actual images to represent them. That alone can make those dreams feel so much more concrete. If it exists SOMEWHERE than why WOULDN’T you be able to create it in your own life? Why not you?? I remember when I was leaving my full-time job in NYC to move out to Colorado, I really wanted to stay on remotely as a freelance designer so I could have SOME income coming in while I got settled in and established a new business. A friend of mine had worked out a similar situation at a different company while she lived abroad for a few months. And I remember thinking, "if she can do it, I can do it." Notice how I didn’t think, “That’s impossible. She got lucky. I’ll never be able to create that.” I took small actions that were in line with what I wanted and, of course, I was able to CREATE what I wanted because I KNEW what I wanted. And here’s the real game-changer—taking those aligned actions in business almost always results in more sales. I’ve seen it time and time again in my own life and business. The cutest little pup on my vision board represented being financially stable enough to get and raise a puppy of my own. Now, I’m greeted each morning by Samson pawing at the blankets, telling me it’s time to start a new day. The image of pancakes and coffee on the patio represent lazy weekend mornings and quality time with my man—yet another thing that has shown up for me in my own life. The image of a microphone on my vision board represents a wildly successful podcast—the very one I’m working toward now. What’s one goal you’ve taken aligned action toward and seen big results because of it?